Nearly 1,000 people, including several ministers, converged at the Palayam Jama Masjid here early Tuesday to bid adieu to noted poet and writer Kamala Das, who died Sunday. She was a soul that knew how to sing! The award-winning writer, who wrote in both Malayalam and English, was accorded a state funeral and policemen gave a gun salute as her body was interred. Kamala Das, who converted to Islam a decade ago and was known as Kamala Suraiya, died in Pune early Sunday. She was 75. she suffered from diabetes and was recently hospitalised with pneumonia. The end came in a private hospital. Her body was brought here Monday night after being taken to Thrissur, Kochi, Alappuzha and Kollam, where thousands of her admirers paid their last respects, many with tears in their eyes. The body was kept at the VJT Hall here from 8 p.m to 11 p.m Monday and people came in hordes to have a last glimpse of the noted author. Chief Minister V.S. Achuthanandan also paid his last respects. On Tuesday morning, the mourners at the funeral included many politicians including Minister for Overseas Indian Affairs Vayalar Ravi, Kerala's Revenue Minister K.P. Rajendran and Water Resources Minister N.K. Premachandran. The mood was sombre when her body was lowered into the resting place at 9 a.m. and people took turns to drop clods of earth as is customary at funerals. Earlier, separate prayers for men and women were held according to traditional Muslim customs. The poet Kamala Suraiya has spread the fragrance of Neermathalam and the hidden emotions of a female mind to an international level through her confessional writings. It is difficult to see any other Indian poet who found herself amid controversies at all times for her truthful writings. 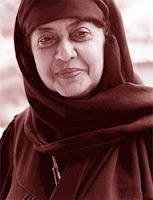 India's foremost poetess Kamala born on March 31, 1934 at Punnayurkulam in the Malabar area of Kerala. She born in the great Kerala literary household Nalapattu, as the daughter of V.M.Nair and well-known Malayalam poetess Balamaniyamma. She acquainted with the great writers in Malayalam literature at a tender age and had enough exposure due to her stay at Calcutta and Kerala. The young Kamala read the Malayalam translation of Victor Hugo's Les Miserables by Nalapattu Narayanamenon at a tender age of eight. This ancestral house and the love of her grandmothe influenced the young 'Amy' to grow into the Malayalam writer Madhavikutty as well as English poet Kamala Das. Kamala never initiated into professional writing till her marriage. She married Madhava Das at the tender age of fourteen. Madhava Das was much elder to her and kept a father role to both Kamala and her children. When Kama das wanted to initiate writing, her husband supported her decision. There she started to write about her nostalgic feelings and hidden feelings. Kamala' first poetry collection Summer in Calcutta promised the rise of a revolutionary woman poet in India. Her writings mainly reflected woman's longing for love and her restrictions in the society. Her stories and poems were greatly misunderstood and criticized by a section of Indian critics. Her poems like An Introduction, The Descendants, Alphabet of Lust and Only The Soul Knows How To Sing were open voices of restricted women in an orthodox society. Her autobiography My Story, published in 1976 put her on the centre of controversies. When this confessional work has been translated to more than 15 languages, Inadian critics accused for spreading the idea of unmarital relationships. Kamala Das took a controversial step in 1999, as she converted from Hinduism to Islam in 1999. The poet who always wrote about Lord Krishna and imagined to be his Radha suddenly started to address Allah. Her statement "I converted my Krishna to Islam" evoked much opposition from conservative Hindus in Kerala. However she was bold in her decisions and continues her life according to Muslim beliefs. Kamala was short listed for Nobel Prize for literature in 1984 along with Marguerite Yourcenar, Doris Lessing, and Nadine Gordimer. Apart from that she received many awards for her literary contributions like Asian Poetry Prize, Kent Award for English Writing from Asian Countries, Asan World Prize, Sahitya Academy Award and Kerala Sahitya Academy Award etc. Her popular English works include "The Sirens" (Asian Poetry Prize winner), "Summer in Calcutta" (Kent's Award winner), "The Descendants" (poetry), "Alphabet of Lust" (novel), and "Yaa Allah" (poems). Among her Malayalam works are "Pakshiyude Manam" (short stories), "Thanuppu" (short story and Sahitya Academy award winner), "Balyakala Smaranakal", "Varshangalkku Mumbu", "Palayan" (all novels), "Neypayasam" (short story), "Neermathalam Pootha Kalam" (novel and Vayalar Award winner) and "Madhavikkuttiyude Unmakkadhakal" (short stories). Kamala was also a painter and many of her works fetched high prices in exhibitions. In 1999 she announced she was embracing Islam and changed her name to Kamala Suraiya. In 2007, she decided to shift her base from Kerala to Pune to live with her youngest son.